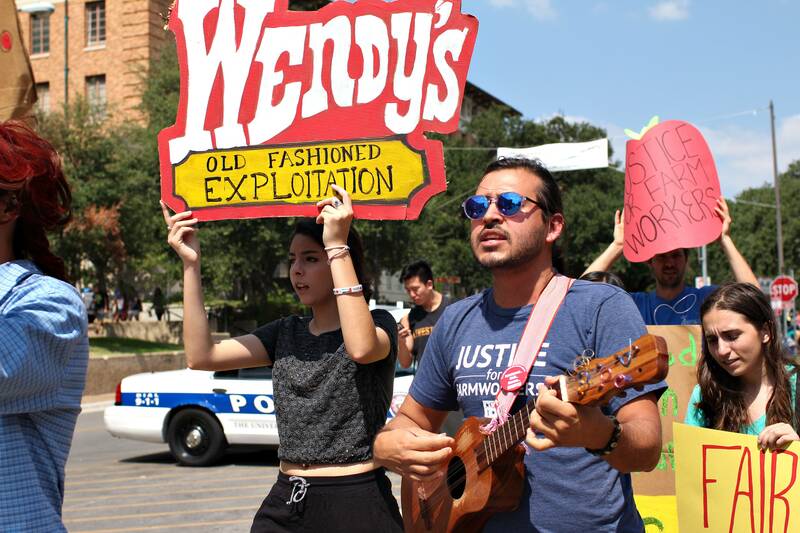 The UT Student-Farmworker Alliance held a rally/protest across the West Mall for Wendy’s refusal to join the Fair Food Program on Sept. 30, 2015. The Fair Food program is aimed to improve wages and working conditions of farmworkers. In 2003, UT students of several organizations joined the “Boot the Bell” campaign by donning tomato suits and chanting in hopes of boycotting Taco Bell for not treating farmworkers humanely. Last fall, this call to action was revived when the UT chapter of the Student-Farmworker Alliance (SFA) marched across the West Mall to “Boot the Braids,” a campaign to boycott Wendy’s. The cause driving some students to protest the two Wendy’s franchises on campus currently is similar to the cause that was able to mobilize students so many years ago: Wendy’s has not signed onto the Fair Food Program, a partnership among farmworkers and food companies that helps guarantee fair wages as well as other humane working conditions for those who work in the fields. Wendy’s is now the last of the five major food chains in the U.S. to not sign onto the Fair Food Program, and last fall, UT’s SFA had a protest, hosted a movie screening and sent an open letter to President Gregory Fenves encouraging UT to break their contract with the Wendy’s in Jester and in the Texas Union. UT has not stated whether they will end their contract with Wendy’s, but given UT’s size and prominence in the state, SFA believes losing UT’s business could be a wake-up call for Wendy’s. Students in the campaign hope Wendy’s will be pressured into signing a deal with the Coalition of Immokalee Workers (CIW) — an organization known for its work in fighting for the humane treatment of farmworkers — if their consumers, such as UT, send a clear message. Latin American studies senior Carlos Salamanca, an organizer of SFA, said this could be done by cutting the contract altogether or through a large, national boycott. Before there was “Boot the Braids,” there was “Boot the Bell,” the first attempt on campus and in the nation to get a major food corporation to sign an agreement with the CIW. The CIW launched its first boycott against major fast food company, Taco Bell, in 2001. The CIW then traveled to churches and universities around the country to get consumers on their side. UT students were some of the first to join the boycott among major universities. In 2003, many UT student organizations worked together to have weekly protests, according to Jordan Buckley, who attended UT from 2000 to 2006. Buckley was a part of the Campus Greens, one of the many organizations involved with the boycott of Taco Bell on campus. “I think Austinites have a proud heritage of early involvements in this campaign and transformed one of the most exploitative industries in our country, and UT students have been a part of that collective effort of solidarity with these farmworkers since the get-go,” Buckley said. At UT, attempts to get a resolution passed in Student Government as well as an attempt to work with the Texas Union Board failed, but as the campaign continued, more students across the nation began to get involved. By 2005, more than 200 schools, such as UT, joined the campaign, and 25 high schools and universities, such as Notre Dame and the University of California in Irvine, were able to end contracts or pending contracts between their schools and Taco Bell. This collective effort is one of the major reasons why, after four years of the national boycott, Taco Bell signed an agreement with the CIW in 2005 promising fair treatment and wages for farmworkers, according to Natali Rodriguez, a spokeswoman from the national SFA. 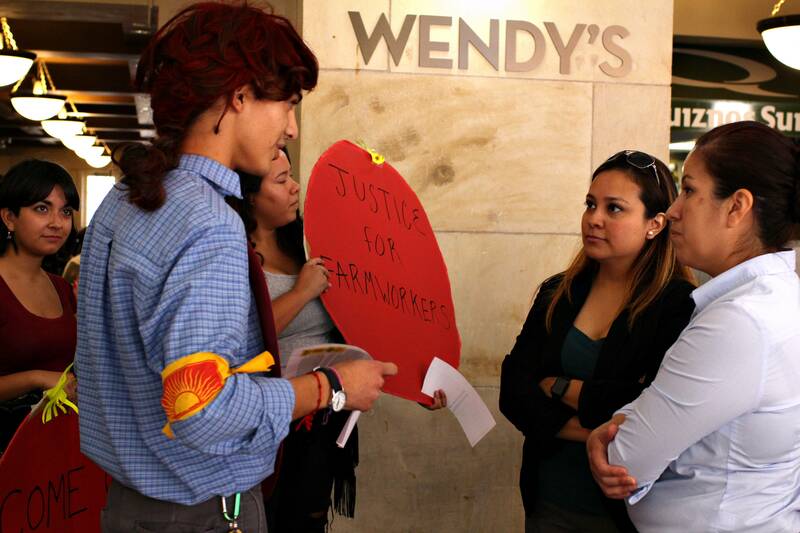 Today, the CIW has been able to make deals with major companies like McDonald’s, Subway, Burger King, Whole Foods and Walmart — but Wendy’s is still not on that list. Wendy’s spokesperson Bob Bertini said Wendy’s, like many companies, does not purchase directly from the people who harvest the produce they use in their food. Wendy’s gets their produce from distributors who employ farmers. Therefore, Bertini said he does not think the company should be responsible for the extra fee they would be required to pay if they made a deal with the CIW. Bertini said Wendy’s only works with suppliers and companies that share their commitment to quality, integrity and ethics and even created a code of conduct for their suppliers in 2015 to prove that. The Wendy’s code of conduct lists expectations for distributors in regards to worker treatment, hiring practices, wages and benefits, child labor and workplace discrimination. According to their code of conduct, their distributors are expected to comply with the Fair Labor Standards Act, which is a federal act that serves as a guideline for fair labor treatment. CIW member Santiago Perez said the Wendy’s code of conduct isn’t enough and does not respond to what the group is asking of all food corporations. He spoke to the Daily Texan in Spanish, and his interview was interpreted by Natali Rodriguez of SFA. Salamanca said he was glad to be redirected to the University Unions, but does not believe UT will step in as long as there is a monetary incentive that benefits them. According to the contract between the University Unions and UT, the Wendy’s at the Union and the one in Jester pay the University a 5 percent royalty if they make anything less than $1 million, 6 percent royalty if they make $1 million to $1.2 million and 7.5 percent if they make anything higher than $1.2 million dollars. Soncia Reagins-Lilly, dean of students and senior associate vice president for student affairs, has oversight responsibility of the Texas Union and spoke to the Texan on behalf of the director of University Unions. She said all matters of civil liberty of workers rights is important to the University and something they hope to fix through a culture change. After Reagins-Lilly spoke with the Daily Texan, she and Salamanca have had one meeting regarding the issue of Wendy’s, where she made sure SFA was in contact with the right people. Salamanca said he thinks Reagins-Lilly’s comments are an example of the University’s “pseudo-concern” for the issue, and said he does not believe much more action will come from the University. Active effort is something that could tip the scale in favor of the SFA and CIW, according to Rodriguez, who said an institution as big as UT holds a lot of cards in debates such as this one, and the Taco Bell campaign was proof of that. The efforts by the 200 schools involved with the “Boot the Bell” campaign and the 25 schools that were able to end current or pending contracts were the tipping point for Taco Bell and reason they were the first to sign a deal with the CIW, Rodriguez said. Rodriguez said she believes the best and only way to make a company as big as Wendy’s sign their deal is to have a large backing by consumers. The purpose of the protest and letters against Wendy’s by the SFA last semester was to gain support from the consumers we see every day: the students, faculty and administration of UT. Rodriguez said the Taco Bell campaign proves that a University such as UT could be the decision-maker in a proposition this important, which is why the national campaign will continue until Wendy’s signs the deal and promises accountability for the fair treatment of farmworkers.